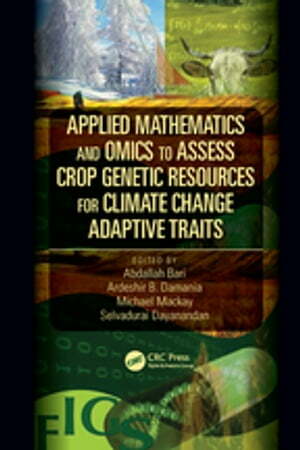 Collins Booksellers - Applied Mathematics and Omics to Assess Crop Genetic Resources for Climate Change Adaptive Traits by Abdallah Bari, Ardeshir B. Damania, Michael Mackay & others, 9781315359991. Buy this book online. Applied Mathematics and Omics to Assess Crop Genetic Resources for Climate Change Adaptive Traits focuses on practical means and approaches to further the use of genetic resources for mitigating the effects of climate change and improving crop production. Genetic diversity in crop plants is being further explored to increase yield, disease resistance, and nutritional value by employing recent advances in mathematics and omics technologies to promote the adaptation of crops to changing climatic conditions. We are in the midst of significant changes in global climates, and its effects are already being felt throughout the world. The increasing frequency of droughts and heat waves has had negative impacts on agricultural production, especially in the drylands of the world. This book shares the collective knowledge of leading scientists and practitioners, giving readers a broader appreciation and heightened awareness of the stakes involved in improving and sustaining agricultural production systems in the face of climate change.